I was hungry for some potatoes and had some tomatoes I wanted to use up and so I came up with this. Not super low calorie but not super high either. And pretty yummy. Hope you enjoy. Heat oil in a pan over med heat. Add the onions, garlic and potatoes and toss to coat with the oil. Season with salt, pepper and thyme. Continue to cook over medium heat until potatoes are tender. Remove the potatoes from the pan and place in a casserole dish and drizzle with a tiny bit of bacon grease. Add the tomatoes to the pan you were cooking the potatoes in and saute for a few minutes until tomatoes are cooked. 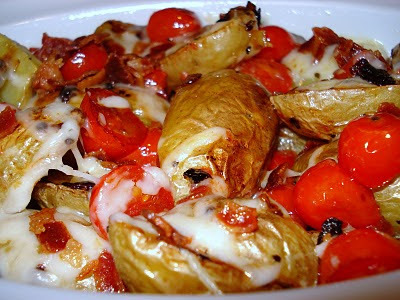 Combine the tomatoes with the potatoes and add the crumbled bacon. Toss with the cheese and bake in the oven at 450 for just a few minutes till the cheese is melted to your liking.